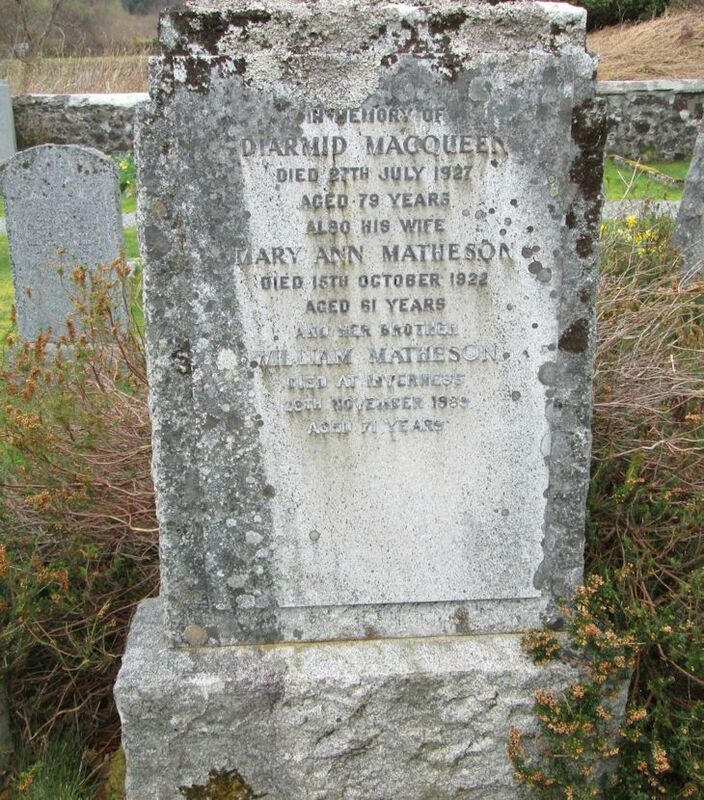 Skye Gravestones | Diarmid & Mary (Matheson) MacQueen. Diarmid & Mary (Matheson) MacQueen. In memory of/DIARMID MacQUEEN/died 27th July 1927/aged 79 years/also his wife/MARY ANN MATHESON/died 15th October 1922/aged 61 years/and her brother/WILLIAM MATHESON/died at Inverness/29th November 1939/aged 71 years..
Oh wow this is so great to view my distant cousin/ancestors from here in NZ. Added by Christine Barbour on 03 April 2018. Hello Christine, noticed that the image wasn't complete so updated it. Pleased to see that the website was useful to you. Added by Roddie Macpherson on 04 April 2018. Oh that's amazing thanks. I didn't notice him earlier and been trying to find him today, so now the puzzle is solved.Just have their brother Donald to find. He was bequeathed a house in Tain in 1885, from his father William, cattle dealer of Skye. Added by Christine Barbour on 04 April 2018.